Pierce the skins of the aubergine to prevent them from exploding, leaving them whole and either grill them under a hot grill until skin is crispy and charred or bake in hot oven (220C / 425F/ gas 7) until well roast and soft (30 – 50 mins). When cool enough to handle cut aubergines in half and scrape out the flesh with a spoon. Do this over a bowl to catch any juices. In the bowl mash the roast aubergine flesh and juices with a fork until almost smooth. You can also use a handblender, but do not over blend. Add all other ingredients and taste for seasoning. If taste is too strong add a few tbsp water. 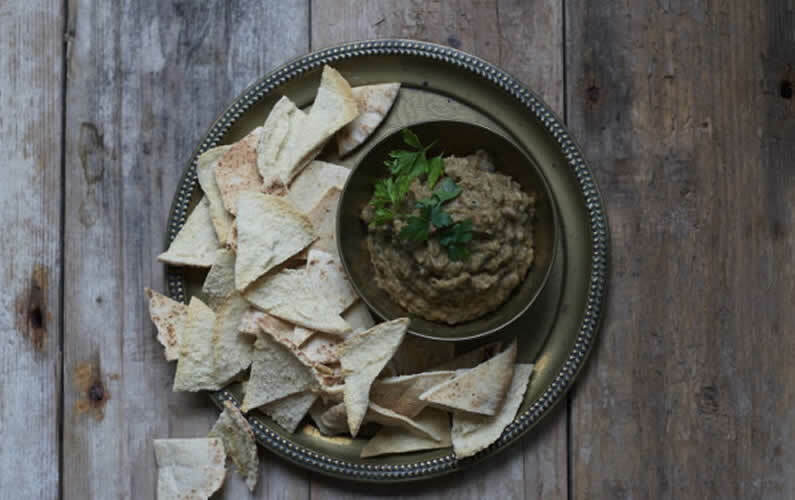 Serve with grilled pitta bread strips, oatcakes or crudites.